How do I manage the Permissions page? 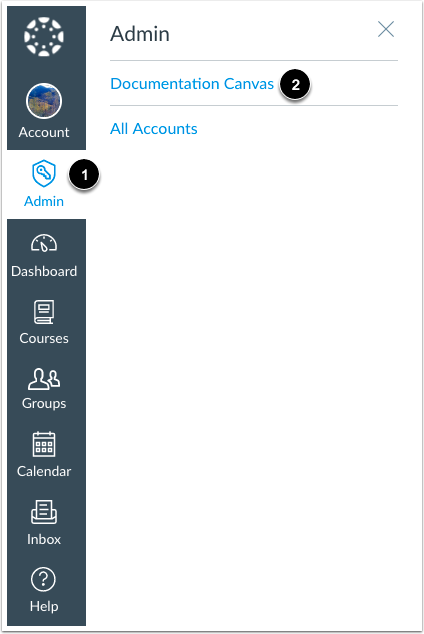 As an admin, you can review and manage permissions for course-level and account-level user roles. Depending on the user role, you may want to edit default permissions and set custom permissions for a user role in your account. Permissions grant or deny access to specific features within an account and course. Note: Some permissions may not be available for sub-accounts. For full details about sub-account permissions and limitations, view the Canvas Account Permissions PDF. 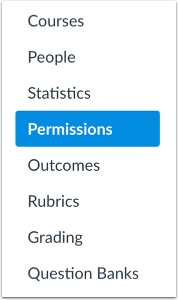 By default, the permissions page displays course-level user role permissions . To view account-level user role permissions, click the Account Roles tab . To search for a specific permission, type a permission name in the Search field . The search field uses predictive filtering. You can also filter permissions by role. By default, the Permissions page displays all user roles. To filter permissions for a specific user role, type or select the name of the user role from the Permission Role Filter menu . You can use the search and filter options to search permissions for specific user roles. To view information about a specific permission, click the permission name. The permission sidebar displays the permission name . View and collapse specific details about the permission by clicking the What it Does and Additional Considerations arrow icons . Please note some permissions may not include these details. 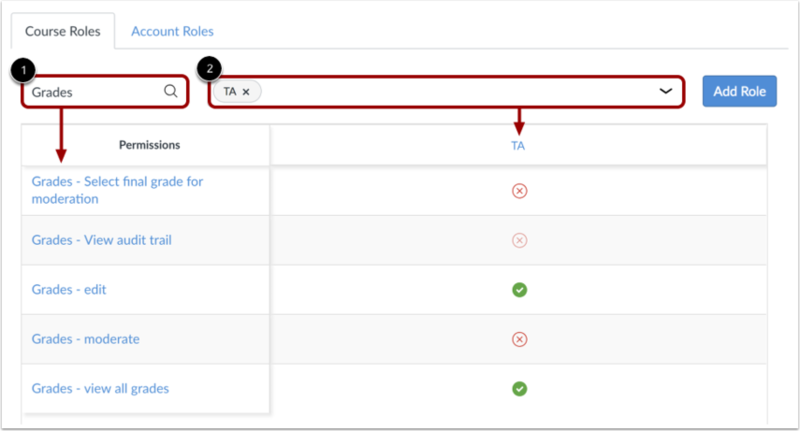 The sidebar also displays the Assigned Roles section , which shows all enabled roles for the permission, and the Unassigned Roles section , which shows all disabled roles for the permission. To manage user roles for the permission, click the icon next to the name of a user role . In the permission menu , the existing permission is indicated by a check mark. Choose the new permission status by clicking one of the permission options: Enable, Enable and Lock, Disable, Disable and Lock, and Use Default. Locked options keep the setting from being changed by subaccount admins in a lower account. The new permission status is saved automatically. Note: If a permission icon does not display as opaque, you cannot change the permission . To view all permissions assigned to a specific role, click the role name . You can manage permissions for account-level roles and manage permissions for course-level roles. To add an account-level role or add a course-level role, view the tab for the appropriate role and click the Add Role button . Previous Topic:What user roles and permissions are available in Canvas? Next Topic:How do I add an account-level role in the Permissions page? Table of Contents > Roles and Permissions > How do I manage the Permissions page?